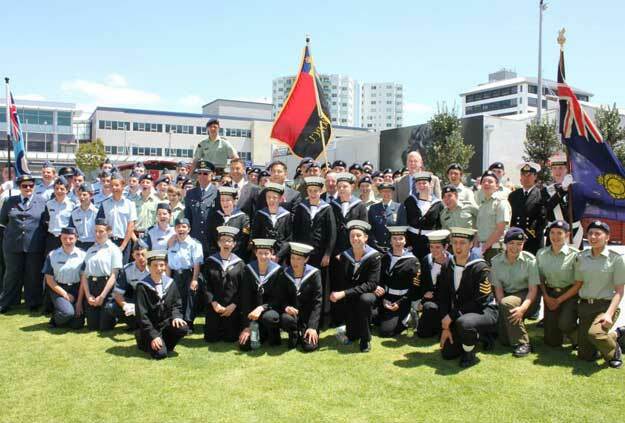 We are part of the New Zealand Cadet Forces (NZCF) which is for both boys and girls aged 13 to 18. It comprises of the Sea Cadet Corps, the New Zealand Cadet Corps and the Air Training Corps. NZCF is a voluntary, disciplined, uniformed youth training organisation whose vision is to train and prepare the youth of today for tomorrow. The organisation is not part of the New Zealand Defence Force (NZDF), but is directed by the Chief of Defence Force, on behalf of the Minister of Defence, and is supported in partnership by the NZDF and the community. Basicly the NZCF is a youth organisation with a miltary flavour. The New Zealand Cadet Forces mission is to develop confident, responsible young citizens who are valued within their community by providing them, within a military framework, safe, enjoyable and challenging opportunities. The New Zealand Cadet Forces (NZCF) vision is to prepare New Zealand’s successful leaders of tomorrow. With this vision, they have developed their mission: To develop and enable self-disciplined, confident and responsible young New Zealanders. Courage – Confronting challenges both physical and moral, to overcome any adversity. Commitment – Being reliable and loyal, serving and supporting the NZCF, local communities and NZ..
Comradeship – Looking out for each other, having respect for all, and championing the benefits of friendships, teamwork and diversity. Integrity – Having discipline, always being honest, trustworthy and responsible. We achieve this by offering a variety of skills and activities that young teenagers do not get with other youth organisations.